This verse refers to the fact that our will is dominated by the will of Allah, and He permits man to go forward to the extent that is in accordance with the plan of the universe; hence, the will of men either may not be implemented or may be implemented partially and in any case it will lead to suffering; so, suffering in life should strengthen our comprehension of Allah (Tabatabai, 1417 AH, vol. 20, p. 327). It can be concluded from the comments of Allama Tabatabai that there is only one way for men to be relieved of suffering and it is to vanish his will in Allah’s will and in this way he can attain the level of Contentment. Also, consent to divine fate is introduced as the best medicine for sorrow and suffering in a hadith from Imam Ali (PBUH). He said: being content with divine fate is a good way for relief of grief (Al Laithi al-Wasiti, p. 494). When the heroine of Karbala, Lady Zeinab (AS), was asked about the battle of Karbala and the tragedies that she suffered, she answered: “I saw nothing but beauty” (Ibn Nema al Holli, 1369, p. 71). Perfect people are the apparent icons on Earth. The followers of these great people should be aware like themselves that difficulty and hardship in the way of Allah for true believers are beautiful, pleasing and good like comfort. Among treatment, pain, coupling and separation … I like what the Dearest (Allah) likes. The same behaviors also can be seen in the companions of Imam Hussein (PBUH): Imam Hussein (PBUH) turned to Qasim ibn Hasan (AS) and said: “How is the death for you?” He answered: It is sweeter than honey for me. In the following prayers we can find the result of reliance on Allah and relief of suffering in Imams’ life: You are my only wish, and only for you I stay awake during nights, and my eyes’ light and heart’s wish is to meet You, my delight is towards you and I’m longing for your friendship, and my great love is for You. Also, Muslim thinkers and mystics have explored various aspects of the real cause of joy: for example Ibn Sina believed that the greatest joys are with Allah and Allah is the happiest one in the universe; because the most perfections are with Him and the highest perceptions, too; there is no being more perfect than Him in the universe. There is no defect in him. The source of the pain and suffering are inexistence and shortcomings and he is free from them and hence he is the first happy being in the universe and the only way to reach the true happiness is to find a way to get nearer to him. In other words, everyone who is closer to him is happier and everyone who is further away from him is sadder. Accordingly, we can say that saints and devotees to Allah have indescribable joy and happiness. (Ibn Sina, vol. 4, p. 40, 41). Without any obligation, and not on account of the (future) reward and recompense; nay, but his nature has become so goodly. Wherever the Eternal Command takes its course [he will follow], living and dying are the same for him. He lives for God’s sake, not for riches; he dies for God’s sake, not from fear or pain. His faith is (held) for the sake of (doing) god’s will, not for the sake of Paradise and its trees and streams. For God’s sake his (own) death and the death of his children are like sweetmeat to him. Since their spirit had experienced that delight, these delights seemed to them (mere) a childish play. The most basic program to achieve true peace is a program that covers all innate tendencies. True peace comes when the other aspects of human nature are considered so that the spiritual thirst of human may be satisfied. We should look for a program that brings freedom and peace, hope and love, humility and strength, light and joy at once to humans, and this program could be received only from Allah; because otherwise the peace is imaginary and is nothing more than a mirage. True peace will be attainable through linkage with monotheism, under god’s patronage and by a simple and clear religion, in a way that meet all the beautiful and enchanting natural tendencies. (Mazaheri Saif, 1387, p. 56). This part of the prayer introduced their companionship and exact obedience as the basis for reaching to divine destination of humanity. In this way, if anyone does not wish to be strayed, should be fully associated with Infallible Imams (PBUT). To be relieved of the suffering we should follow a practical plan consisting of eight methods including true cognition, true thought, true speech, true action, true life, true effort, true awareness and true empathy (Hawkins, 1380, p. 64 65 / Shayegan, 1356, vol. 1, p. 141). True empathy (meditation): thinking and meditation. The mystic takes this eight-step through three practices; it means that firstly he starts with the best behavior that is truth and honesty in speech, action and life; then he will turn to the greatest empathy that is travelling through intimate worlds and attention and meditation; it means that he pays attention to honesty in effort, awareness and empathy and then he will reach to the superior cognition (panna) that is the true cognition and true thought (Pashaei, 1380, pp. 29, 30). 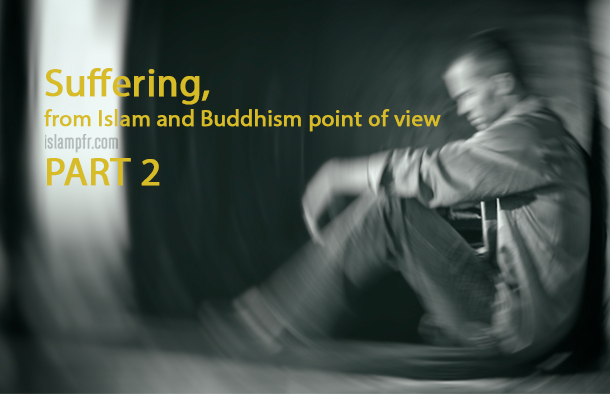 As stated, in Islam, the most important way to be relieved of suffering is reliance on Allah, Contentment to divine fate; but in Buddhism there is no content about the source of creation and there exist the belief that it is incomprehensible. Buddha says: “Creatures’ straying has begun from a time without start. No origin can be found from which the creatures are derived” (Shayegan, 1356, vol. 1, p. 142). Also Buddhism has no religious law, therefore it is called “Buddhism” not Buddha religion. Basically, Buddhism is a spiritual and moral movement and even Buddhists have regarded themselves, from ancient time, not only as a monastic order, but also as a Spiritual movement, with popular aspects. They emphasize on the ways to rescue people from suffering and torment that surrounds them, and to bring them to Nirvana (Hume, 1376, p. 91). One of the important teachings of newly-born mystic orders is the suffering issue in life and the ways to be relieved of them. Buddhism pays more attention to this issue from other religions. Buddha has a dark and pessimistic view to this world. He also states some way for relief of this suffering. Buddhists try to remove painful and stressful and worrying factors, without reliance on a supporter with absolute power and unlimited love (Allah). As a result, the peace that they are looking for is nothing more than a mirage and it is a negative peace. Although, the existence of difficulties and disasters in the life of all mankind are admitted by Imams (PBUT), but the suffering caused by disasters, depend upon human’s point of view to them. When human looks at the disasters in a negative viewpoint, he will always suffer from them; but if he looks in positive viewpoint, as Shiite Imams (PBUT) faced disasters and calamities, since they had reached the level of contentment and faded their will in the will of Allah, he will wholeheartedly feel a close connection with someone needless, pure, beautiful and kind and will seek definite peace only in his remembrance and consent. So, they say that “We saw nothing but beauty” and are completely released from the abyss of sufferings. The friends of Allah are indeed in peace with Allah’s remembrance; because, although they were caught in hard disasters, but they never suffered from psychological problems and anxieties. The life of these great Ones is an evidence for this claim.